Department of Art | This is the last week to see Cute & Creepy! Exhibition closes Sunday, November 20th. Home » This is the last week to see Cute & Creepy! Exhibition closes Sunday, November 20th. This is the last week to see Cute & Creepy! Exhibition closes Sunday, November 20th. 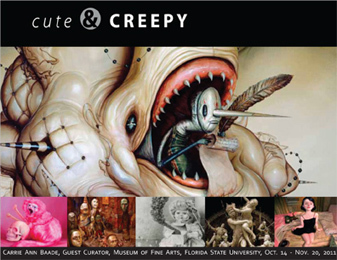 Guest curated by Carrie Ann Baade, this exciting exhibition features artworks inspired by the grotesque from the Pop Surreal (or New Contemporary) art scene. The museum is open special extended hours Friday, November 18th 9am – 9pm and will also be open Saturday and Sunday 1-4pm. Exhibition catalogs are available with the purchase of a 1-year membership — ONLY $25 ($15 for students and seniors). The museum will be closed the weekend of Thanksgiving, November 24-27 and December 4th.